Ingredients: almond, argan, lavender, rosemary,geranium, lemon and tea tree oils. The combination of almond oil, argan oil and essential oils leads to an in depth and immediate recovery, nourishing and strengthening the hair. It stimulates growth of the hair. It perfectly smooth's the surface of the hair and gives it a brilliant shine. 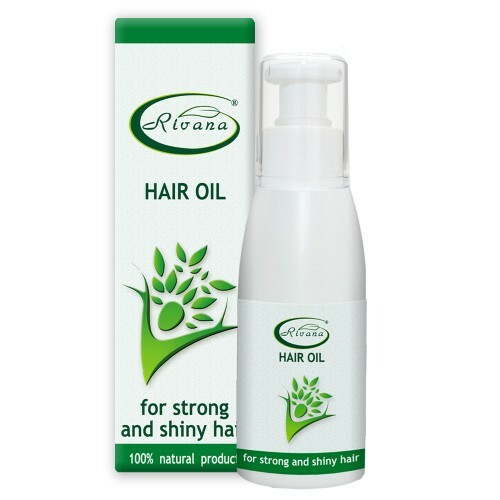 The argan oil restores the damaged hair while retaining moisture, improves and strengthens the hair. Almost immediately improves elasticity, reduces frizz, and revitalizes hair damaged from dyeing or drying. Almond oil is one of the most powerful natural stimulants of growth and strength of the hair. Lavender oil reduces dandruff, removes hair loss, nourishes, refreshes and restores shiny hair. Rosemary oil tones and stimulates hair growth and prevents premature shedding and dandruff. The widespread use of rosemary oil against hair loss made it popular around the world.Tea tree oil regenerates and strengthens the hair, removes dandruff. Geranium oil gives freshness and aroma of the hair. Lemon oil increases the elasticity of the hair, it contributes for softness and shine to the hair. Apply the oil on a clean hair, rub it on the scalp with massage movements and spread it throughout the length. Allow the oil to stand for 1 to 2 hours, by covering the hair with a plastic cap or a towel, and then wash it with a shampoo. Caution: Avoid contact with eyes! Keep away from children! Should not be used by pregnant women, nursing mothers and people with individual intolerance to essential oils. Do not take it internally!